Each year the U.S. produces 15 million pounds of artificial food dyes which go directly into growing bodies. Yellow No. 5 and No. 6 received recent attention after being banned in several European countries. Parents are concerned about this potentially harmful additive because of its frequent use in food marketed to children. With the exception of beautiful produce, food isn’t always as colorful as a rainbow. Food dyes are chemicals added to enhance the appearance of food and serve no other purpose than to maintain or improve its aesthetics. Dyes are cheaper, more stable and much brighter than most natural colorings, but many question whether or not food dyes are safe. What are yellow No. 5 and No. 6? Yellow No. 5, also known as Tartrazine or E102, and Yellow No. 6 are on the list of FDA-approved food dyes found in candies, ice cream, potato chips and sodas. Yet avoiding junk food doesn’t completely solve the problem. Yellow dyes are also found in pickles, American cheese, boxed macaroni and cheese, crackers, jams, lemonade, sports drinks, cereal, condiments, shampoos, medications and toothpastes. Food dyes are derived from petroleum, the same thing used to make motor oil. 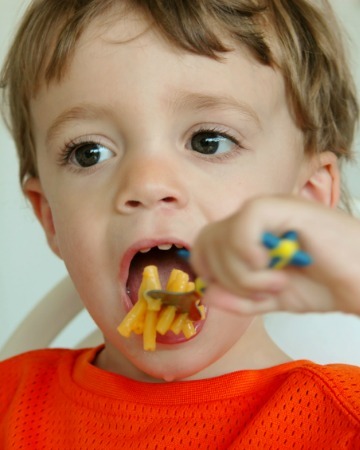 Osteopathic physician and best-selling author Dr. Joseph Mercola writes that E-numbered food dyes, such as Yellow E110 and E104 do as much damage to children’s brains as lead. The food industry, however, argues that the quantity present in food is too small to cause any real harm. Regardless, there is zero nutritional value to food dyes and there is emerging data on their health risks. Yellow dyes have come under recent scrutiny after several studies found a causal link with genotoxicity and adrenal tumors in lab animals. Food dyes have also been implicated in Attention Deficit Hyperactivity Disorder (ADHD), kidney tumors, migraines, bed-wetting, behavior problems and asthma. Many parents who eliminate food dyes from their children’s diets see the immediate remediation of behavioral and health problems. Documented cases of food dye allergies prompted the Code of Federal Regulations in 2013 to mandate a warning statement of possible allergic reactions on the packaging of food containing Yellow #5. Many European countries use natural substitutes for yellow dyes and some countries, like Austria, Finland, Norway and Sweden, ban these dyes altogether. You may not suspect a food dye allergy in your child or worry too much about the health risks of food dyes, but one thing cannot be denied — yellow food dyes have no health benefits and are contained in processed foods with limited to no nutritional value. Reduce your consumption of processed food. The more highly-processed the food, the more dyes are required. Educate yourself to read labels wisely. Shop the perimeter of the grocery store with a list of ‘Badditives’ found on DieFoodDye.com. Chose naturally- over artificially-colored foods. Avoid any ingredient that contains a number. Select fresh fruits over canned or jarred. When baking, use natural food coloring recipes for cakes and icings. For special occasions, try dye-free candy found at NaturalCandyStore.com, Whole Foods, Trader Joe’s, UnReal Candy and YummyEarth.com. Replace toothpastes and shampoos with dye-free alternatives. Refer to DieFoodDye.com for a list of products containing dyes. Remember, don’t compromise health by pinching pennies with lower-quality foods. Invest in wellness. Illness always costs more in the long run.